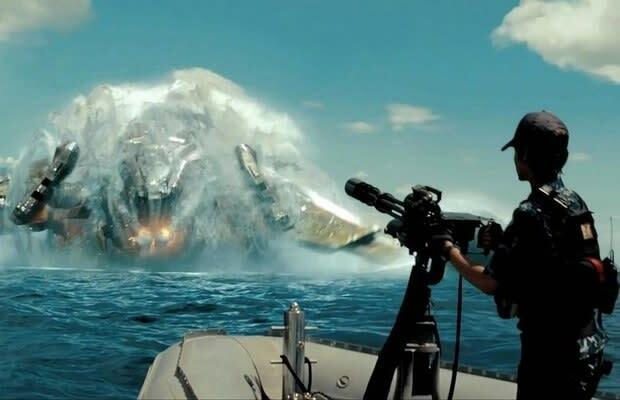 Critics and cinema purists can hate on Michael Bay all they want, but one thing is certain: The man has a distinct style, and he does it better than anyone else can. Thus, it's both saddening and embarrassing to watch the otherwise competent director Peter Berg (Friday Night Lights, The Kingdom) knock around in Bay's sandbox for two long, hollow hours. Presenting the classic strategy-first board game as a wannabe Transformers blowout, Battleship sacrifices character development, smart dialogue, and acting coaches' souls to make room for nothing but expensive (and, admittedly, strong-looking) CGI, loud noises, and pretty faces backed by amateur chops (Brooklyn Decker, Rihanna).